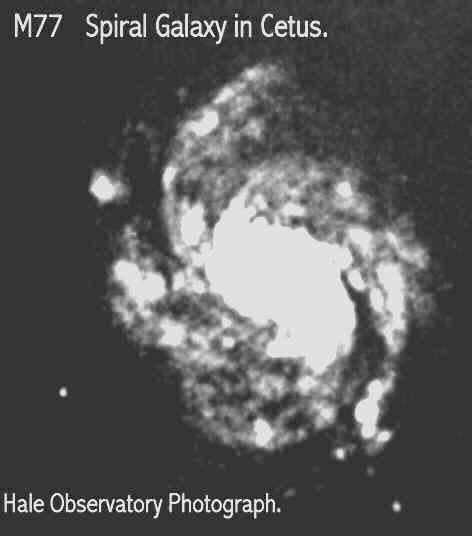 The illustration below is a print out from the “Starry Night” astronomical computer program supplied by Sienna Software inc., on CD-Rom. It shows an event, which will occur, in the twilight western skies on the evening of the 6th of April this year. Given good weather and clear, atmospheric pollution free ‘seeing’, observers in western Europe will have the opportunity to watch the spectacle for almost two hours from soon after sunset at 7-30 p.m. to about 9-20 p.m.
Dependant upon the position of the observer and the ‘seeing’ conditions the sky may not be dark enough to allow the stars forming the pentagon shaped head of Cetus to be visible, though the stars of Aries at a higher elevation above the Ecliptic may be in view. The ‘Ecliptic’ is the apparent path of the planets and the sun seen against the background of the fixed stars and it is represented in the illustration by the green single line ascending diagonally across the scene. But why should all this be of interest to ‘Croppies’? 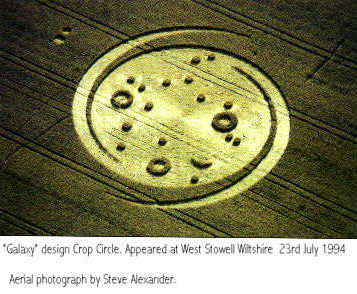 It is because at West Stowell, Wilts., on the 23rd of July 1994 , a so called ‘Galaxy’ crop formation appeared which depicted this conjunction of the three planets and the crescent moon and told us precisely where in the heavens it would occur. There were many aerial photographs taken of the West Stowell formation. A shot from directly overhead would have made an accurate positional analysis of the ‘star’ positions easier. In the absence of such a shot the best that could be done was to try to correct for the parallax effect of the angle of observation .in Steve Alexander’s excellent picture, (see below) , and select a group to use as a key in a search of Star Charts published by the British Astronomical Association. Perseverance and luck played equal parts in revealing the surprising results. The above photo turned 90 degrees clockwise. The ‘Stick Man’ figure revealed by ‘joining the dots’ is perfectly matched on the BAA Star Chart. Superimposed on the head of the Cetus star constellation. Note the ‘Stick Man’ and the central Cetus pentagon. The fifteen ‘stars’ of the crop formation virtually lock on to real stars in the group. The three planets, represented by the rings in the West Stowell Crop Formation have been pulled off the nearby Ecliptic and placed in roughly the same relative positions to each other as they will be at the time of the conjunction. Curiously the crescent moon in the field formation is a mirror image of how it appears to our eyes, it is facing the wrong way. 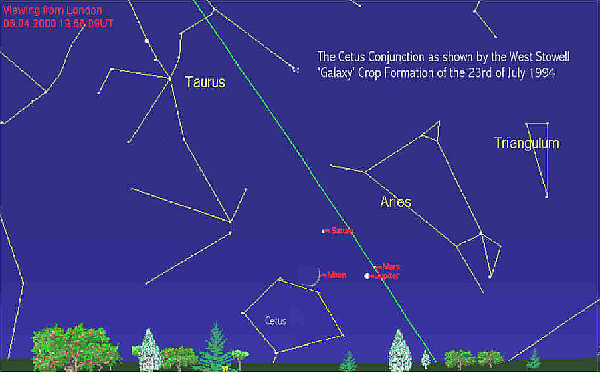 The moon’s field position relative to the to the Cetus pentagon Is actually where it will be at midnight on the 6th of April but by this time the whole group will be well below our western horizon and one would have to be in North West America or Alaska to view this event in their evening western skies. On the ‘Starry Night’ coloured print out shown at the beginning of this article, the Cetus pentagon is prominent below and to the left of the Conjunction. The closest assembly of the three planets will occur on the 13th of April. We may just about be able to view this event too in the western evening sky but it will be mush nearer the horizon just after sunset and likely to be lost in the glare of the sun. The moon will be approaching three quarter full at that date and will not be in the region. Whoever or whatever produced the stunning work of art and science that is the West Stowell ‘Galaxy’ formation, a great depth of astronomical knowledge and astounding technical and practical skills were used to create it. It is a further curiosity then that ‘their’ knowledge did not extend to knowing that the group of stars they used to point to the conjunction contains the distinctive pentagon shaped head of the Sea Monster Cetus. This pentagon shape has been familiar to ‘star gazers’ for hundreds if not thousands of years and it is one which would have been instantly recognised. The obscure ‘Stick man’ group actually used presented unnecessary recognition difficulties. One further ‘coincidence’. Below the left thigh of the ‘Stick Man ‘on the B.A.A. 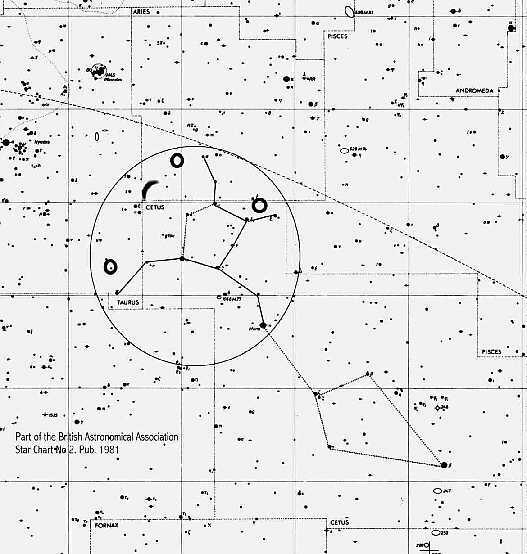 Star Chart there is visible a small oval labelled M77. This is a real Spiral Galaxy situated thousands of light years beyond the Cetus constellation. 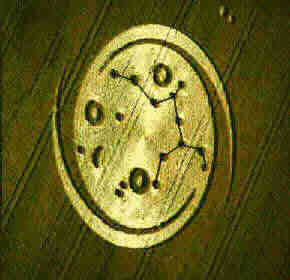 It has a shape remarkably similar to the winged spiral surrounding the West Stowell crop formation. See the photo below.